Conflict is inevitable at work. But when a conflict escalates to hostility, how you react to the attack can mean the difference between a quick resolution or a full-on battle. Follow this advice to maintain control of your own emotions while still seeking a resolution to the conflict. Do not interrupt. If you break into the tirade, you tell the speaker that you are not really listening. You create the impression that you have prejudged the situation and that you are not interested in the other person’s side. Keep your imagination in check. Don’t escalate the situation in your mind. A person who is upset about a current situation does not necessarily plan to stay angry forever. Show your willingness. An angry person may feel that you just don’t understand the situation and why it matters. When you have a chance to speak, say “I want to understand.” Then paraphrase what you heard, using your own words, and ask the person if you perceive the situation accurately. Once you are satisfied that you understand fully, you can move toward resolution. Train yourself to deal with aggressive people at work in a calm manner. Your goal should be to express yourself assertively, with no hint of aggravation. 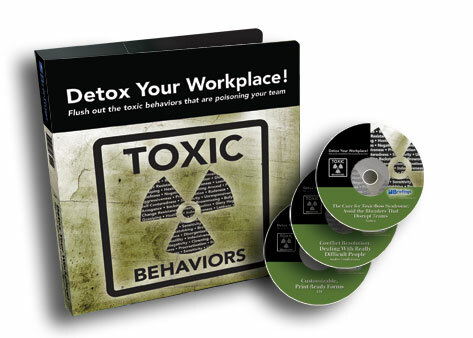 Order Detox Your Workplace! to learn how to address the behaviors of these toxic employees: Backstabber, Change Resister, Gossip, Lazy Person, Office Clown, Passive-Aggressive Person and 15 more troubling employees! Your average work environment can be downright toxic. And we don’t mean it’s toxic with hazardous materials. We’re talking about toxic people and how their behavior can hurt everything from collaboration and productivity to the customer experience and the bottom line. With the Detox Your Workplace! training kit, you can address negative behavior before it destroys your team. Even if you feel your team is healthy, you can use the advice presented in this training kit to recognize warning signs and flush out toxic behaviors—before they contaminate your team. The 19-minute video The Cure for Toxic-Boss Syndrome: Avoid the Blunders That Disrupt Teams, with a companion Trainer’s Guide and Viewer’s Guide. The 60-minute audio conference presentation Conflict Resolution—Dealing with Really Difficult People. A Customizable, Print-Ready Forms CD trainers and trainees can reference again and again. This entry was posted in Workplace Training Center and tagged Communication, Conflict Resolution, Difficult Conversations, Leadership, training. Bookmark the permalink.